A luxury Honeysuckle and Jasmine Black Reed Diffuser. This beautiful Honeysuckle and Jasmine Reed Diffuser is a favourite of ours, a Beautiful British summer garden fragrance. 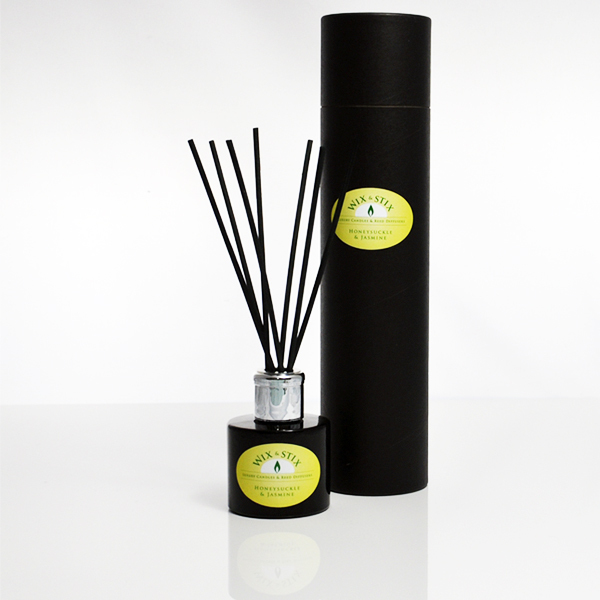 This Honeysuckle and Jasmine reed diffuser is hand made by us in the United Kingdom and presented in a superb black gift tube. An excellent gift for yours and and especially for you. I purchased a reed diffuser in Stratford from your stall last weekend. It’s lovely! Fills the room in a morning. Love the smell. If am in Stratford again for Xmas and I see you, will stop and buy another.